PATIALA, 4 DEC.: On the concluding day of 3-day Rababi Bhai Mardana Classical Music Festival, Vice Chancellor Dr. Jaspal Singh, Dean Faculty of Arts & Culture Dr. Gurnam Singh and others honoured a renowned Classical Vocalist Pt. 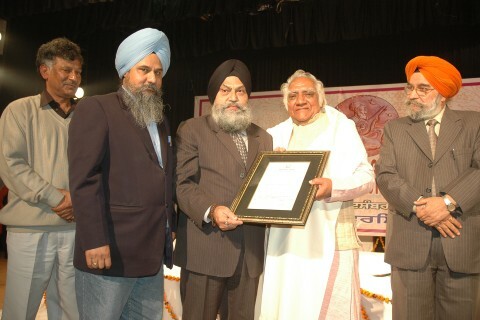 Yashpal from Chandigarh with the title of 'Punjab Sangeet Ratan Award - 2009' sponsored by Bibi Jasbir Kaur Khalsa, Chairperson Sri Guru Gian Parkash Foundation New Delhi. Famous Punjabi Classical Vocalist Pt. Yashpal ji of Agra Gharana is a well known name in the field of Indian Classical Music. As a Vocalist and academician, he has contributed alot in Indian Classical Music and Punjabi Music tradition. Pt. Yashpal ji started giving performances as Classical Vocalist from the age of 11 only from Harwallabh Sangeet Sammelan. Top Grade Artist of All India Radio, Pt. Yashpal ji has been honored by many prestigious awards like Dedicated Educationist, Sangeet Sumeru, Sangeet Shiromani, State Award by Punjab Government and Punjab Sangeet Natak Academy Award. On this occasion, Dr. Jaspal Singh stated that in the present scenario of music world, training and presentation of Classical Music is utmost needed for the authenticity and promotion of different music streams of Punjab. He appreciated the efforts made by Faculty of Arts & Culture and declared that on the next year, along with the junior artists from younger generation, Punjabi University will organize this festival with more enthusiasm. In this festival, the renowned classical artists of national and inter-national repute participated. Amongst them, 'Singh Bandhu' S. Surinder Singh (Classical Vocalist), ), Pt. Yashpal (Classical Vocalist), Dr. Nivedita Singh (Classical Vocalist, ), Pt. Rama Kant (Tabla Player), Sh. Manu Seen (Sitar Player), Dr. Harvinder Sharma (Sitar Player), S. Shaminder Pal Singh (Sarangi Player and Sh. Arun Kumar Jha (Pakhawaj Player) are prominent names that performed during this festival. On the last day of this festival, the first presentation is given by Sh. Arun Kumar Jha, a Pakhawaj player from the Music Department of Punjabi University Patiala. During his performance, he has given performance for Chaar-taal. The second performance has been given by Sarangi player, S. Shaminder pal Singh and his disciple son S. Satwinder Pal Singh. He has given performances in Raag Vaarspati and Raag Mishar Pahari. In the last presentation, Pt. Yashpal has given a memorable performances by singing different classical compositions. On this occasion, Amarjit Singh Waraich (All India Radio - Station Director), Ravinder Singh (Bansuri Player), Dr. Gurcharan Singh, Dr. Yogesh Gambhir, Dr. Jodh Singh, Dr. Navjot Kasel, Dr. Jagir Singh, Dr. Kanwaljit Singh and many others enjoyed the sammelan. Dr. Gurnam Singh - Dean Faculty, in his thanks giving words appreciated the help and efforts of University Staff and Administration. He also stated that the members of Faculty of arts and culture are very well renowned in their field and we are proud of them that under the leadership of Dr. Jaspal Singh, this faculty will contribute positively for grooming upcoming artists with great potential.